As we get closer to the end of 2003, and you find yourself with extra budget dollars, contact me for pricing information … and also those who need that extra tax deduction prior to year end as well! Penn Camera and I would like to wish everyone in the Sport Shooter community, a very Safe, Healthy and Happy Holiday season. Please keep Penn Camera in mind for your holiday shopping needs, and we'd like to offer FREE UPS Ground shipping for the month of December to our loyal Sports Shooter customers. Purchase an Epson 2200 ($699) and receive a FREE $30 Penn Camera Gift Card ... use it for whatever you'd like at Penn Camera. FREE UPS Shipping for SportsShooter.com members. 3.2 megapixel CCD, 10X Total Seamless Zoom (3X Optical/3.4X Digital), Auto Connect for easy connectivity and downloading, 16Mb Card included...$249.99, less $20 Mail in Rebate ...YOUR FINAL COST $229.99 FREE UPS Shipping for SportsShooter.com Members. The 1st ALL WEATHER, ALL metal digital camera, 3.2 megapixel CCD, Auto Connect for easy connectivity and downloading... $349.99, less $30 Mail in Rebate, YOUR FINAL COST $319.99 ... PLUS, a SPECIAL SportsShooter.com member-only SURPRISE!! FREE UPS Shipping for SportsShooter.com Members. 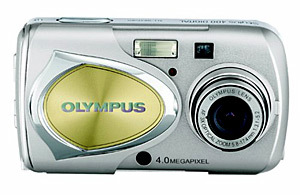 The 1st ALL WEATHER, ALL metal digital camera, 4.0 megapixel CCD, Auto Connect for easy connectivity and downloading... $399.99, less $40 Mail in Rebate, YOUR FINAL COST $359.99.PLUS, a SPECIAL SportsShooter.com member only SURPRISE!! FREE UPS Shipping for SportsShooter.com Members. The "new" and improved version, the CP200 is a portable Photo CD burner, designed for photographers, business professionals and travelers. With no PC needed, the Disc Steno CP200 makes it easy for you to copy data from flash cards to CD-R/CD-RW. This new version is "Multi-Session", use your 1GB or larger cards, and you will be prompted to change CD-R's when the original is full!!! You can repeatedly use your flash card and continue taking pictures. In addition, you can display images by connecting the Disc Steno CP200 to your television. Built-in 6-in-1 Card Reader, USB2.0, 24X CD-R Write Speed, 24X Read. Now supplied with AC Adapter, USB 2.0 Cable, Remote Control, and Full Warranty. SportsShooter.com Member priced at $289 ... FREE UPS Shipping for SportsShooter.com members. Feel free to check with me anytime for the other many "Specials" that are not listed. Quantities are limited to supply on hand.